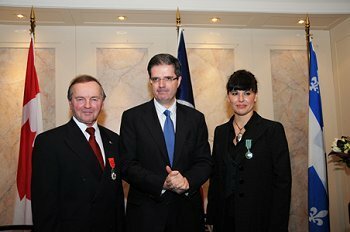 On 1 December 2008, France gave great honor to two citizens of Montreal who have special ties to the INS. Canadian Senator Serge Joyal was awarded France's highest honor, the Legion of Honor, and Nathalie Bondil, Director of the Montreal Museum of Fine Arts, was awarded the highest honor for the promotion of arts, the Order of Arts and Letters. The awards were presented by the François Delattre, French Ambassador to Canada. Distinguished guests for the event included INS founder Ben Weider's widow, Huguette Weider, and political, economic and social leaders from Montreal. Senator Joyal has a long and distinguished career of public service in both the private and public sectors. He was an advocate for human rights as an attorney, and has served in the government of former Prime Minister Pierre Trudeau as a minister of State as well as in Parliament. A close friend of Ben Weider, Senator Joyal was instrumental in facilitating the donation of Weider's impressive Napoleonic collection to the Museum of Decorative Arts, and he donated some items from his personal collection as well. the Director of the Museum of Fine Arts of Montreal. Director Bondil has done an impressive job of creating an outstanding museum in the heart of Montreal. Her work to create an outstanding permanent collection, important traveling exhibitions, and community outreach have made the Montreal Museum of Fine Arts one of the finest of its kind. Her work to add the Weider Collection to the museum's permanent collection, and to host programs that will make use of that collection (including the 2009 INS International Napoleonic Congress) is worthy of great admiration by all who are interested in Napoleonic history and art. The International Napoleonic Society offers its warmest congratulations to Senator Joyal and Director Bondil, and hopes to have a continuing excellent relationship with each of them.